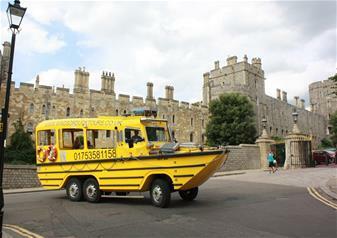 Complete your day in Windsor with a one hour Windsor Duck Tour. Starting off in the heart of Windsor, you’ll get to soak in the town’s idyllic and most iconic sights before you take to the water. As you glide across the river, you’ll get sensational views of Windsor and live commentary giving you incredible facts of Windsor. Packed full of entertaining anecdotes and humour throughout, this tour gives you everything you need to experience the very best that Windsor has to offer.